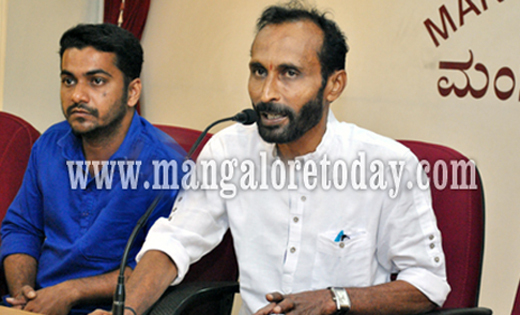 Mangaluru, Mar 2, 2017 : Eminent director of Tulu plays and cinema Vijaykumar Kodialbail has come down heavily on the Mangaluru City Corporation for neglecting theatre artistes by providing them space in the small hall adjacent to the Town Hall for performance of dramas. Speaking to reporters here on March 2, Thursday he accused the MCC of a conspiracy to "push out" theatre artistes from Town Hall where the plays ought to be staged instead of the adjacent hall meant for dining purposes. He recalled the statement made by the District in-charge Minister Ramanatha Rai during the inaugural of the renovated Town Hall that the Town Hall would be a great boon to theatre groups and pointed out that whenever the Town Hall is booked for marriage or any other function, artistes were forced to use the adjacent hall itself which he said lacked basic facilities required to stage a drama including sound and light arrangements, green room etc. The dining hall has a sheet roofing and it is not possible to stage plays during monsoons he said adding the MCC has to either reconstruct the hall to facilitate staging of plays or else face severe protest by artistes. Artist Vidhu Uchil who also spoke said the hall adjacent to the Town Hall though was originally intended to be a dining hall has now been converted into a hall for staging plays by MCC.